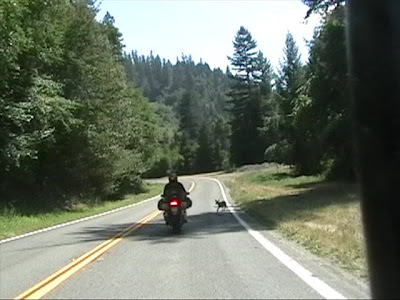 After a late start in Crescent City, where I had to replace the dead battery in my Suzuki 650 V-Strom, we made it barely into Oregon. 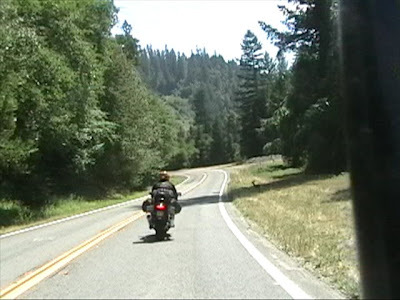 We rode up the Smith River valley on US 199 and then turned south on a county road at O'Brien. It was a beautiful, lonely path back to California. 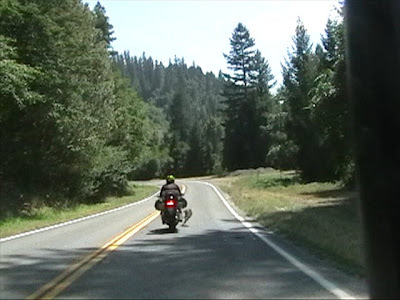 Then we rode down the Klamath River, up the Trinity River and eventually across the mountains to Eureka. Along the way we talked with a flagman while stopped for road paving. 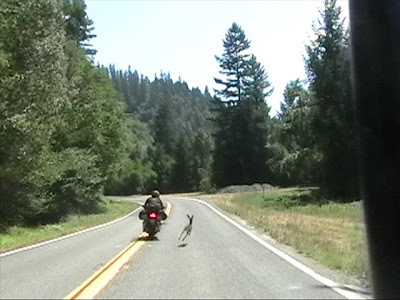 He told us how the afternoon before authorities had to airlift out a motorcyclist who hit a deer nearby. Down the road we found ourselves in heavy forest fire smoke, where several dozen lightning-caused fires had been burning for weeks. 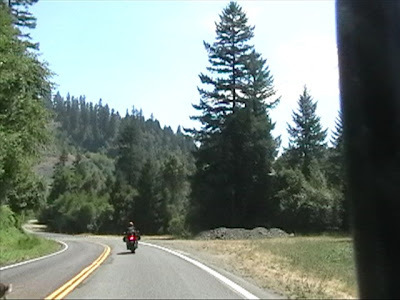 Alongside the Klamath River south of Happy Camp, we saw a fire crew and got a first-hand account from their fire boss and one of the hotshot crewmen. They had spent two weeks moving a back fire three miles across the mountains down to where we could see it burning now just across the river. The hot-shotter, covered in dirt and grime, told how good it felt to "spike in" on the steep hillsides in a sleeping bag after 16-hour work days. As we were leaving, a fire chief on reciprocal duty from Marin County, stopped by to tell us about all the police activity we'd see a ways down the road. Two young men had drowned in the river that morning, one trying to save the other. Both were summer workers at a resort in Happy Camp. 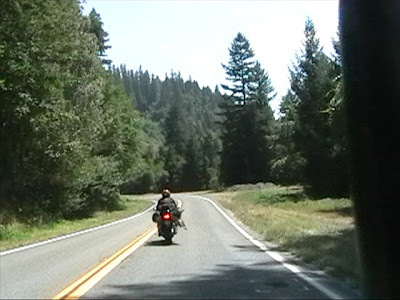 We were glad to leave the fires and tragedies behind us as we continued our ride south on Highway 96. 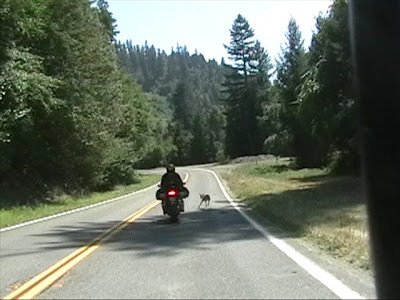 Rounding a curve, a young fawn is relaxing in the shade beside the highway ahead. 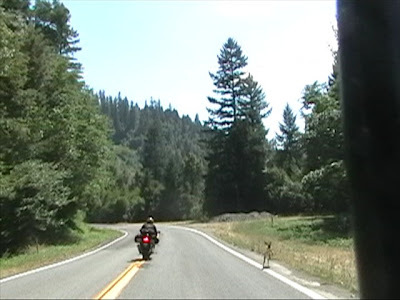 My brother, on his Suzuki GSX1300R Hayabusa, hits the brakes as he sees the deer. The deer heads out to meet him. 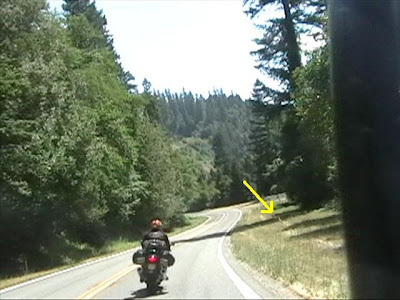 At the last instant, the deer turns, sideswipes my brother's leg, leaving a little fur behind and heads back to the side of the highway. Those four clips from my camcorder happened in 1.5 seconds. 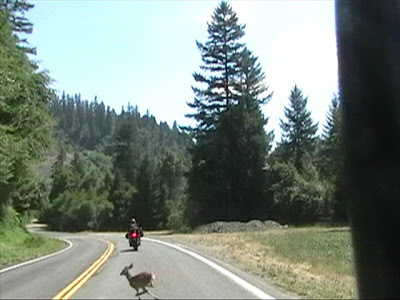 Over the next 2.5 seconds the deer reversed course and ran across the road in front of me, making good its escape to the other side. The entire event lasted six seconds. We didn't stop. This was one hit and run with no consequences. All three parties involved had a story to tell, however.